We have covered a lot of topics during the past few the years on this blog, from snow storms to wildlife on bridges to the making of a Bailey bridge. We have even created other project-specific blogs for the Hood Canal Bridge project and the SR 539 Guide Meridian project. However, we have never taken the time to ask you what you want to hear about. We would like to leave the next blog topics up to you. What would you like to hear more of or more about? What have you always wondered about but have been afraid to ask? Yay! We love hearing from happy drivers. The pavement on I-5 in King County is more than 40 years old. It’s lasted twice as long as engineers thought it would. Cracked and rutted concrete are telltale signs of it being 20 years overdue for a do-over. Since February we’ve worked nights and weekends replacing hundreds of cracked concrete panels and ground out miles of rutted and bumpy pavement. Drivers also are noticing that it is taking awhile for crews to finish the work. It’s true. If you’ve driven the six mile stretch of I-5 between the University District and Shoreline, you’ve probably noticed some sections of the highway have been ground down, and some sections haven’t. It does look as if we started to grind the pavement but haven’t gotten around to finishing the work. Truth is we’re right on track to finish the project on time. It’s like mowing a lawn row after row, only this lawn is 72 feet wide and six miles long – in both directions! Each 12-foot lane requires crews to make several passes with the 4-foot grinder in order to grind the whole width of the lane. Grinding the surface of I-5 not only makes for a smoother ride, it improves traction. Grinding also helps improve drainage on the highway so there is less standing water on the surface when it rains. You can rest assured that we are still on schedule. We promise to finish all of the I-5 pavement repair work by the end of the summer. And trust me: it will be worth the wait. Want to know more? 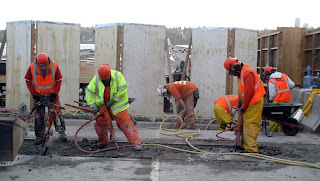 Check out our common questions site and the I-5 Pavement Repair project page. When I was growing up, we had to take home economics. The home ec teacher was fanatical about contrasting colors, textures, and flavors to maximize food exposure. I was thinking about that teacher (who marked me down for macaroni and cheese and carrots as an overuse of a single color) when we took a tour of the noise barriers on the I-90 express lanes where we are using jackhammer and generators to remove the 40-ton expansion joints from the bridge deck. Our temporary noise shields are like seven-layer bean dip. Each layer serves a function. These shields are designed to eliminate some of the noise during the operation of a hand tool, jackhammers, generator, compressor or a a light machine. We use these shields on many of our projects, especially when we work at night, or when working close to homes during the day. You can see the different types and width of the materials, each piece blocking sound or performing some other essential function, working in its own way to reduce the noise. For example, the cedar lattice holds the sound absorbing materials in place and provides some protection from the elements while allowing the sound access to fiberglass insulation. The fine mesh aluminum screen helps to keep the sound absorbing thick fiberglass material from settling to the bottom of the wall. Here is a picture of the shields on I-90. You can see how we shield the busy construction site noise from the surrounding neighbors. A secondary benefit is that drivers on both sides of the I-90 bridge do not slow down to "look" at what is going on by the construction site. Do they work? I checked in with our noise office recently. They’ve been out on Mercer Island every third night with the noise meters to assure residents that we are in compliance with our noise permits. Larry tells me the only thing he’s picking up is the waves lapping on the shore and traffic on the highway and local streets. “Cars, not germs, are the bigger threat"
We are in the midst of an epidemic, although it is not the one that is gathering countless hours of news coverage. It does not involve influenza or any other transmissible disease. Rather, it is the epidemic of motor vehicle crashes. As an emergency physician, I see many people coming to the emergency room with concerns about "swine flu." However, that number pales in comparison to the number of people that I treat who have been injured in vehicle crashes. According to the Centers for Disease Control and Prevention, there have been 1,639 confirmed cases of H1N1 influenza in this country, with two reported deaths. In 2007, 41,059 people were killed in motor vehicle crashes and almost 2.5 million were injured. This is an average of 110 fatalities and 6,800 injuries daily. Virginia has already reported 219 motor vehicle deaths this year. With all the emphasis on containing the spread of the flu [news story, May 6], it is odd that people are apathetic about containing the toll of vehicle crashes. Last year the Virginia General Assembly bowed to constituent pressure and repealed heavy fines designed to discourage dangerous driving [Metro, March 28, 2008]. Perhaps if we start referring to "accidents" as "swine collisions," motor vehicle crashes will finally gain the attention they deserve. Well stated Dr. Goldberg. Thanks for adding your voice to our efforts to change the culture of complacency towards car crashes and to bring about a more positive traffic safety culture in this country. Don’t be a congestion victim! Leave the planning to us. WSDOT’s 2009 construction season is in full swing. We began three-week expansion joint replacement work on I-90 on Monday. The I-5 panel replacement and grinding through Seattle continues for another three months. In fact, construction work will close both the I-90 and I-5 express lanes around the clock this weekend. The Hood Canal Bridge closure is in place for another five weeks. 2009 is our single biggest construction season ever. The 2003 and 2005 gas tax funding is reaching its peak and, yes, there is federal stimulus money too. It’s no illusion, you are seeing orange barrels everywhere and that’s a good thing because it means jobs, infrastructure repair and congestion relief. A lot of folks are asking, what’s next? If you are reading this, the answer is only a mouse click away. We have some great Web pages. You can drill down to find information that matters to you. This is a great place to start www.wsdot.wa.gov/construction/2009. Here you can find out what’s happening now, what’s next and the big picture. What’s happening right now clearly spells out the major closures in the Seattle-Bellevue area today. It’s updated numerous times each day especially when a major construction project is on the roads. No jargon, just the facts, what’s closed and when – thank you very much. Go here before you leave the house: www.wsdot.wa.gov/construction/2009/today. Month by month construction schedule is my favorite. It’s for the super uber-planners like me who like the big 30-day picture with colorful maps and information that can cause congestion, like a Sounders game or the Northwest Folklife festival. Oh and if you want to know more about what we’re doing and why we’re doing it, there are links for that too: www.wsdot.wa.gov/construction/2009/calendar. Last weekend (May 2 and 3) more people came to our site via twitter than any other Web media. We think that’s cool. We’re trying hard to keep our twittering current and useful. Two accounts to watch: www.twitter.com/wsdot and www.twitter.com/wsdot_traffic. If you are a City of Seattle driver, SDOT just launched a very cool construction site. Check it out: www.seattle.gov/transportation/constructionmap. This page will help you check traffic conditions on city streets if you’re looking to avoid a section of highway. Take a tour and let me know what you think. We’re always open to suggestions. Post written by Jamie Holter. Ever get one of those awards that makes you take a step back and go "whoa"? We received one of those recently and it caught us off guard (thus the mildly shocked picture of me and Lloyd to the right). Did you know that as an agency, we have sent out 2.5 million e-mails in the last eight months? Keep in mind these e-mails weren't to just one person; there are over 36,000 of you that we are keeping up to date with information about road closures, construction updates, traffic alerts, mountain pass updates and more. We were recently awarded an "Excellence in Communications Award" from GovDelivery, a company we use to send out our e-mail updates. 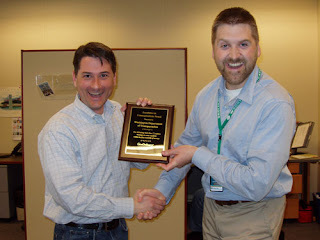 We won this award for sending out more than 2.2 million e-mails during the first six months of service. This is even more impressive when you consider their list of clients. These e-mails weren't subscribers to just one list. We have over 170 different lists that you can subscribe to. Many of those millions of e-mails we recently sent out were due to the crazy weather we had this winter that at one point effectively shut down all north-south, east-west routes in Washington. An e-mail was sent out every time a road was closed or opened during these storms, which was very appreciated by freight haulers and those just wanting to know if they could get home. We also sent out an e-mail every time the pass report changed, and if you know mountain pass weather this can happen several times a day. Other e-mails were just letting you know what is happening with transportation in Washington and how you can get involved in the decision making process through open houses and environmental document review. If you haven't already signed up for our e-mail service, you will be amazed at what you can learn and how your commute will improve because you will be one of the first to know what areas to avoid. Be sure to sign up for our weekly "Express Lane", it's a roundup of weekly activities for the agency and a couple of featured projects which can prove to be very enlightening. Crossing the Canadian border? Find out the best times to cross. pssst... and stay in touch with this service because we are also hoping to use it to send out text messages for traffic alerts in the Puget Sound area...stay tuned.